Admittedly the market for Greek New Testaments is smaller than that of English Bibles. However, there is indeed a market. 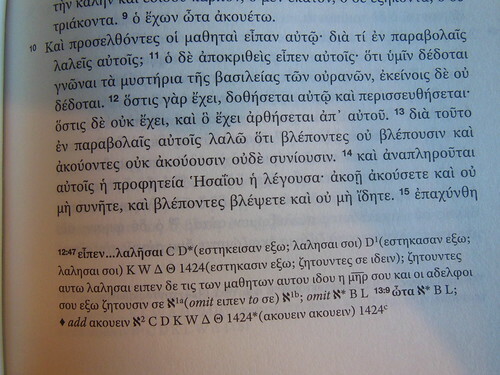 For those of you who have a desire to own a Greek New Testament, I imagine it is because you are either studying Greek, or already read Greek. The most prevalent Greek New Testament out there is the Nestle Aland 28. Crossway decided to produce this edition because of some scribal discrepancies that have come to light. Here is a link to their page with a video that explains more of the reasons why they produced this edition. Here is a link to their FAQ site. I found it helpful. You will too. My review will be more about how well this edition is made. Judging the copy I was sent, I would say that Crossway used some pretty good materials in this edition. The paper was impressive. It isn’t a higher cotton content hardback novel type paper, and it isn’t a thin Bible paper. It has a smooth texture to it and a bit of weight without being as thick and heavy as 80# paper. Crossway says, it is a 70gsm Salzer. I like it. It doesn’t have much ghosting, but is thin enough to make a lighter volume. It is also evident that they employed line match printing. This also makes it easy on the eyes. I know that I started in the wrong order by talking about the paper first. It just impressed me 🙂 the print is nothing to be laughed at either. It is a 10 pt font. That is just about perfect for reading. 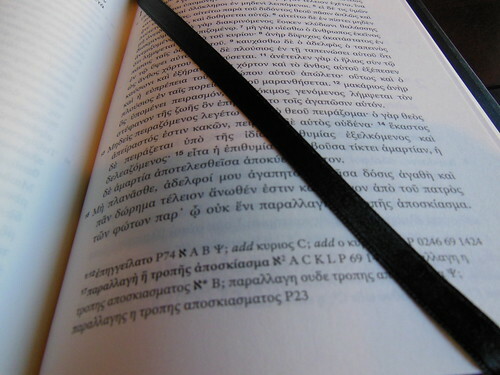 This edition also comes with a higher quality black ribbon page marker. Most Bibles skimp on the ribbon markers, not this one. 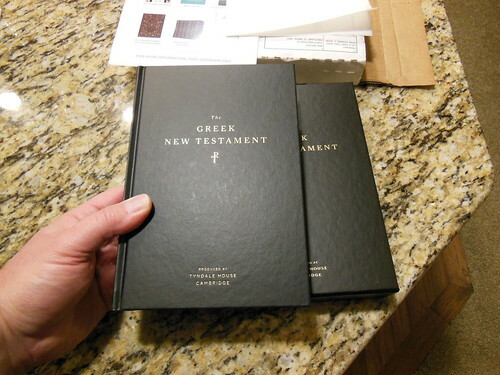 The New Testament comes with a cardboard slipcase. It is pretty sturdy and handsome. Make sure to keep it for storing your New Testament on the shelf. Better to have the slipcase take the ware and tare of being shelved than the edges of your hardcover. This edition has a sewn spine for many years of use and flexibility. The spine didn’t take hardly any break-in time. This edition is case bound obviously. It couldn’t be edge line bound because it is a hardcover. There is a genuine leather edition, but I believe it is also case bound. You could always have it sent out for a rebind if you desire an edge lined edition. This wouldn’t be possible if it didn’t have a quality sewn binding. This is a single column, paragraph layout with book titles, chapter and verse numbers, and page numbers. It is easy on the eyes, very legible. Reading it is more of a strain on my brain as a neophyte, than it is on my eyes. If you are in the market for a Greek NT to read daily, this would be an excellent choice. I am no Greek expert, but I do know about quality in materials and manufacture. This edition is put together well, and should last you a long time. Make sure to look at all the pictures I took of this edition on my flickr page. You can purchase your copy from Christianbook, Amazon, or directly from Crossway. What do we hear, culture, the feelings of people, or God by His word? Who should we obey, our societies culture, human feelings, or God? When other voices lie, and tell you that men and women have interchangeable roles, the word of God is clear. This is in reference to the weekly gathering. Paul explains why this should be in verses 13, and 14. The word, “saved” is from the Greek word, “σώζω sotzo” and is more akin to being made whole, and healthy as in sanctification rather than in the justifying sense. Women are not justified by childbirth, but rather it is sanctifying. If you will notice the proviso of continuing in faith is included. “ 22 Wives, be subject to your own husbands, as to the Lord. 23 For the husband is the head of the wife, as Christ also is the head of the church, He Himself being the Savior of the body. 24 But as the church is subject to Christ, so also the wives ought to be to their husbands in everything. This section of scripture not only prescribes how women should submit, but also displays how it is akin to the submission of the bride of Christ, to Christ as her head. Christ who submitted to death on the cross, to cleanse for Himself a bride. There is no disgrace in humble submission. It is beautiful. You will see this in Ephesians 5 as well. “1 It is a trustworthy statement: if any man aspires to the office of overseer, it is a fine work he desires to do. 2 An overseer, then, must be above reproach, the husband of one wife, temperate, prudent, respectable, hospitable, able to teach, 3 not addicted to wine or pugnacious, but gentle, peaceable, free from the love of money. 4 He must be one who manages his own household well, keeping his children under control with all dignity 5 (but if a man does not know how to manage his own household, how will he take care of the church of God? ), 6 and not a new convert, so that he will not become conceited and fall into the condemnation incurred by the devil. 7 And he must have a good reputation with those outside the church, so that he will not fall into reproach and the snare of the devil. Hopefully you can see from these diverse scriptures the many and harmonious ways that authority and submission are made evident in the marriage, and The Marriage of Church to Christ. Holy submission is not a thing to be rebelled against. The world’s values are not ours. A position of authority in the Church is not an exultation of man, but rather a greater submission in humility to the commission of Christ our King. He places men as Elders to love His flock.